Street Wear counter always attracts me for their nail colors. 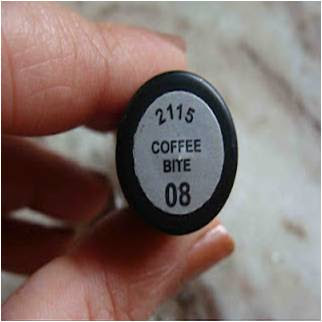 I am composing this review after I have been wearing Street Wear Color Rich Nail Enamel Coffee Bite 08 for about 10 days. 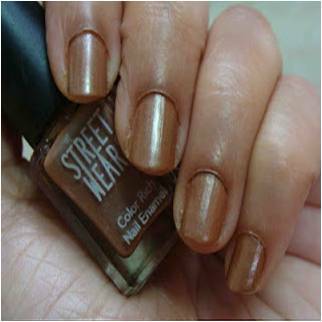 My Experience with Street Wear Color Rich Nail Enamel Coffee Bite 08: The enamel comes in glass bottle of square edge and a black plastic cap. The cap has a brush applicator. Coffee Bite is a wonderful shade with little shimmer in it. I feel that the shade is an extension of skin color. 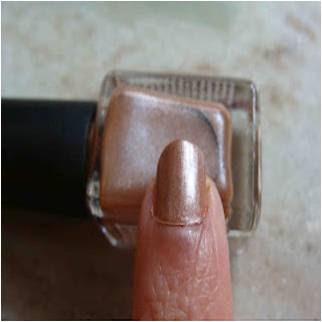 The brush applicator glides well along the length of the nails and does not streak. The quality of the enamel is good and color pay off is also good. It dried pretty soon. 2 coat gave me a perfect shade. But I went ahead to try with the 3rd coat and it gave a dark color, which I regretted after applying. The enamel gives a glossy shiny look. After about a week of application, the enamel is chipping from all possible nail corners. The color did not fade. A week's stay on my nails is more than sufficient. There are more bright colors to select from this range. And the shade collection is also wide. - Good quality enamel. Gives glossy finish. - Good quality brush. Glides well without streaking. Chand is a working mother of an active 10 month old daughter with a passion for blogging and loves to share her wonderful experiences with one and all.